Performers include: Maureen McCormick, Eve Plumb, Jerry Houser, Ron Kuhlman, Florence Henderson, Keland Love, and Ann B. Davis. 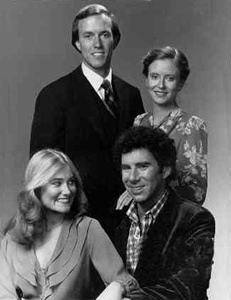 The success of the three TV reunion specials, The Brady Girls Get Married, spurred the creation of this spin-off sitcom. The trio of 30-minute specials is the only reunion event to feature the entire original Brady Bunch cast and centers around the double wedding of eldest sister Marcia and middle sister Jan. In the series, Marcia (Maureen McCormick) is a clothing designer who’s married to Wally Logan (Jerry Houser), a lovable, goofy guy who works as a salesman for the Tyler Toys company. Jan (Eve Plumb) has become an architect, like her Dad. Her new husband is Phillip Covington III (Ron Kuhlman), an uptight college professor. Neither couple can afford to buy a house on their own so they decide to buy one together. They move into a house that the girls’ mother, Carol (Florence Henderson), finds for them in her current job as a real estate agent. Adjusting to married life and their new living arrangement isn’t always easy for the couples, especially when they have very different tastes in most every way. Thankfully, the Brady girls know all about working out problems. Former Brady housekeeper Alice (Ann B. Davis) and spunky young African-American neighbor Harry (Keland Love) can be counted on to stop by and help them sort things out. The show’s theme song is based on the original series’ with an obvious change in lyrics. This is the only incarnation of the Brady series to use a studio audience. Marcia is excited when she’s invited to take part in fashion show for her company, Casual Clothes, one that will be attended by the famous fashion critic, Mr. Blackwell. The show is in a few days so she has to work fast. Wally gets excited when he learns that Marcia’s asked two professional models to come to the house for fittings and even cancels his plans to go bowling with Harry. He gets upset when two hunky male models (guests Tom Gagen and Tom Jordan) show up instead of beautiful ladies. While Jan gets weak in the knees, Wally gets more and more jealous of the men. He ends up insulting them and the models get angry and quit. Marcia’s livid and can’t find replacements in time for the show. While trying to apologize, Wally agrees to stand in as a model and they soon rope conservative Phillip into doing the same. At the fashion show, Wally and Phillip model sporting outfits for skiing and fencing. Alice helps backstage and has to force nervous Phillip onto the stage more than once. Carol helps to cover backstage delays by entertaining the crowd. When Wally gets stuck in his scuba outfit, it’s left to Phillip to model “Jungle Fever,” a leopard-skin bathing suit. After the show, Marcia asks Mr. Blackwell for his opinion. The critic says that he didn’t like anything but that’s his job. More importantly, the buyers seemed to love her work. While Wally continues to struggle to get out of his wetsuit, the couples all have a good laugh over their crazy fashion show. First aired: April 17, 1981. The Bradys have returned in several specials and series over the years. Wally and Phillip both returned for the 1988 holiday movie, A Very Brady Christmas, and the 1990 TV show The Bradys.